InspectAPedia tolerates no conflicts of interest. We have no relationship with advertisers, products, or services discussed at this website. Efflorescence causes, cures, & significance in buildings. Salt Deposits, Brown & White Bubbly or Fluffy Crystalline Deposits Diagnostic & Identification Photographs. Moisture, rising damp, seepage causing white stains & deposits in buildings: white deposits on building surfaces are often efflorescence, a mineral salt that some people mistake for mold. Here we define efflorescence and we describe what causes this white powdery growth or stain on building surfaces. What does efflorescence mean as an indicator of moisture problems in buildings? This article series illustrates and explains white or sometimes reddish brown bubbly surfaces on walls and white powdery or crystalline deposits left on walls, especially masonry walls, by moisture - efflorescence. Our photo at page top shows white fluffy crystals of mineral efflorescence near the bottom of a poured concrete foundation wall. We also provide a MASTER INDEX to this topic, or you can try the page top or bottom SEARCH BOX as a quick way to find information you need. When investigating a building for a leak, water entry, or mold problem, you can save mold test costs by learning how to recognize Stuff that is Not Mold or is only Harmless Mold but may be mistaken for more serious contamination - save your money. But it is important to recognize efflorescence as an indicator of the moisture or water flooding or leak history of a building because those conditions in turn can cause costly damage, mold contamination, or other unhappy conditions. Here we discuss: mineral efflorescence - a substance often mistaken for but that is not is not mold. 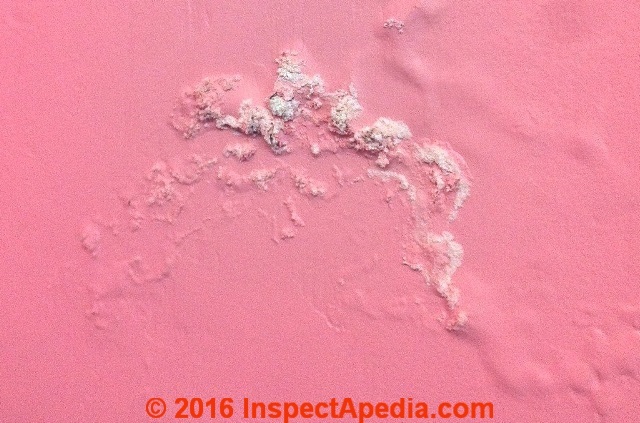 We describe how to diagnose powdery white blotches on a painted stucco exterior wall - Stucco Bloom. How to identify signs of moisture or water entry in buildings & signs of high moisture. Although efflorescence and mineral salts left behind by water are not mold they mean that mold-friendly conditions are present in the building. How old is the efflorescence and how long does it take for efflorescence to form? Efflorescence = efflorescence = efforfescense = efflorescence if you're spelling efflorescence wrong. EFFLORESENCE AGE: HOW OLD IS IT? 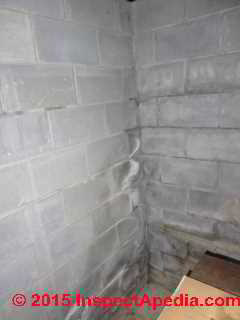 Just above we show very typical efflorescence deposited on a concrete block crawl space wall. The location of these deposits is significant: efflorescence high on the walls of this crawl space suggests that the problem originates outside with roof runoff spilling by the foundation wall. Take a look at the relation between the efflorescence marks and the height of soil against the wall and look for gutters spilling by the foundation or in-slope grade around the building. Efflorescence or "mineral salts" is a whitish crystalline or powdery deposit on damp masonry walls, especially foundation walls which are located below ground level. Our photo (at left) shows a less serious case of white deposits on a concrete block foundation wall - white wall deposits at the mortar joints. This usually-white fluffy material is efflorescence, a crystalline mineral salt left behind as moisture comes through the wall and evaporates into the building interior. Efflorescence is not mold, though it is an indicator of wet conditions that could contribute to a mold problem somewhere in the building. Efflorescence can vary in its chemical composition and therefore its color too. Reported since 1877, these salts leach out of brick, concrete, concrete block, stucco, and in some cases even stone. The salts that you see have been left deposited on the surface as water evaporates. Carson Dunlop Associates' sketch illustrates how efflorescence is deposited on building interior walls. Multiple kinds of mineral salts (chlorides, nitrates, vanadium, chromium and molybdenum) may be present in efflorescence material, depending on the masonry or stucco composition). Vanadium salts, common in clay or brick products from some areas such as Southwestern U.S., may produce green efflorescence on white or buff burned clay surfaces. 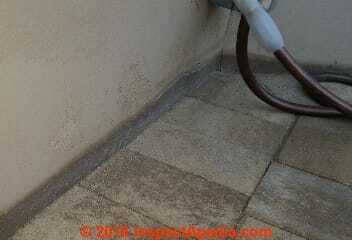 Other efflorescence salts leave white or gray deposits. Above we see loose bulging paint and finally white mineral salts of efflorescence on a masonry wall. In looking for the moisture source that explains this paint damage and the white deposit the occupant reports a possible air conditioning system condensate drain leak above the area where this damage was seen. at EFFLORESENCE & BROWN DEPOSITS. white mold that looks at first glance like "dryer fluff", polyfill or fiberglass. 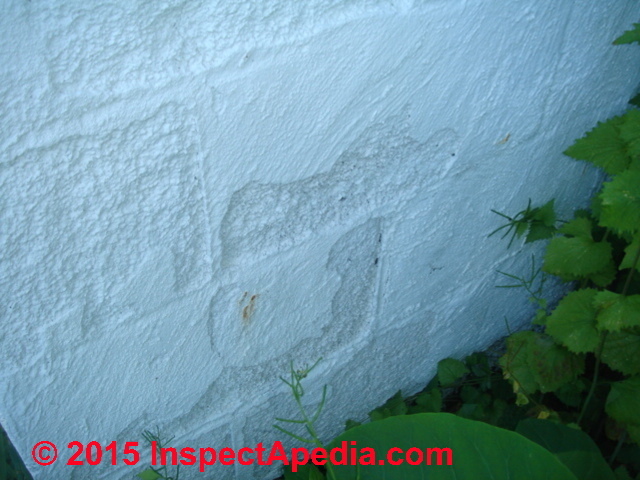 Reader Question: Is the white stuff in this picture efflorescence? I would appreciate your opinion on whether the attached photo is most likely efflorescence. Thank you for your time - J.L. You may use the attached photo for your website if you wish. If it is efflorescence then I think my photo might be better than the one you presently have. Thanks for the question & photo, J.L. Yes this looks like and most likely is indeed mineral efflorescence, though I can't be completely certain from just the photo. The white crystalline filamentous material is reflective, shiny, and appears to be "growing" up thorough a painted surface. There are some white molds that also produce white filamentous growth, but I wouldn't expect them to be shiny and reflective as is your photos (I've cropped and enlarged a central portion of your image - click to see an enlarged version of photos at InspectApedia). Since efflorescence is basically a crystalline salt left behind as moisture evaporates through and off of a surface, you can expect it to be shiny, reflective, and fragile, crushing to a fine powder or dust under a fingertip. As we explain in these articles, you can vacuum or wipe away the material, but unless you correct the underlying moisture source, just as with mold growth, it is likely to return rather soon. Let's look at typical white efflorescence more closely. 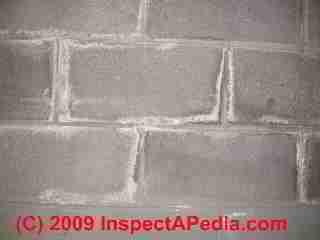 Below are some examples of efflorescence on a masonry block wall that I inspected in New York. Looking at this material with a low power magnifying glass you can easily see that it is hairy and even crystalline (photo above right). at EFFLORESENCE: IMPLICATIONS for BUILDING CONDITION & SAFETY. Here is a photo of efflorescence (mineral salt) which we collected from the wall (above) using clear adhesive tape, so you can see the appearance of mineral salts left behind by water leaking through a masonry block wall. We used a low power stereoscopic microscope to see what this stuff looked like but it was not very informative so we decided to take a closer look using our Polam high-power light microscope. Here's the same tape sample of efflorescence under the high power microscope at about 100x. You can see the crystalline structure of this substance in the long, translucent fibers. The black stuff is dirt from the wall surface. Shown just above are two high-magnification microscopic photographs of efflorescence (mineral salts) which we took at 720x in our lab. 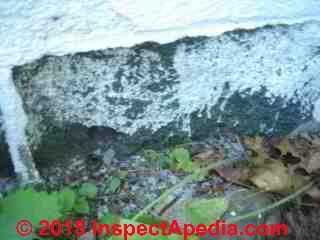 This efflorescence sample was collected as "white powdery or cottony stuff on the foundation" by our client. It's easy to see that this is a mineral like substance, crystalline. It is not organic, not mold. 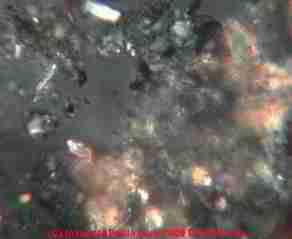 Below are two more microphotographs of larger particles of mineral efflorescence taken in our lab at 480x (4/19/10). The first image is in transmitted light. 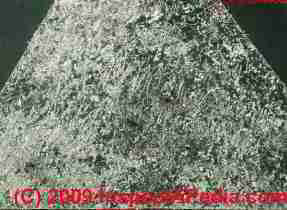 Below our image of the same particle shown above uses cross-polarized light to demonstrate a mineral quality of the substance. On the sample tape the material appeared as a white and light lemon-yellow powdery substance. What Does it Mean to Find Efflorescence and Stains in a Building Interior? Interior or exterior effloresence found on building surfaces (virtually always masonry or some kind of painted or coated masonry) means that there are wet conditions at the property. In turn these wet conditions can be the cause of other building problems such as rot, insect attack, or mold contamination. In our photograph at above left the client is pointing out that water has been entering this basement from the very top of the foundation wall (due to outside roof spillage and bad drainage). 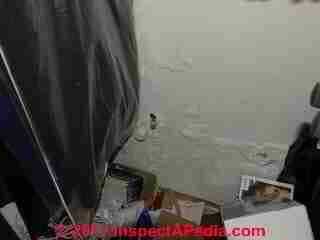 We did not agree with the contractor who told her this was "rising damp" due to wet soils. Rising damp would hardly leap from floor to foundation wall top in a specific narrow area such as this one. Rising damp can't jump. At above right, in a Poughkeepsie NY home, we see the classic downspout spilling by the corner of the foundation problem indicated by dark water stains and white efflorescence in an inverted "Vee" at the basement foundation wall corner. Outside, large buried rock may play a role in directing surface runoff towards the foundation, but it makes sense to correct the inexpensive obvious mistakes first. Below you see one of the downspout ends at the same home - spilling right by the foundation wall in an area that does not drain away from the structure. Watch out: MOLD & HEALTH WARNING: although efflorescence is not mold, it often indicates wet conditions that cause problem mold growth elsewhere in the same building. Moisture from a damp or wet basement or crawl area will pass upwards through the building riding on rising air through air bypass leaks or even moving simply because of vapor pressure differences: moisture always moves from a more damp area towards a more dry area. Higher in the building, even in the building top floors, attic or cathedral ceilings, this same moisture may become trapped in or condense in building cavities leading to a costly hidden mold problem. and at ATTIC MOLD CAUSES. In sum, the downspout spillage shown at above right might be causing basement or crawl space water entry (shown above) that in turn might be the source of the moisture found in an attic and dancing there in the form of frost or mold or roof sheathing stains (photo at above right). You'll need to identify the sources of moisture or leaks and correct them, and depending on other building air quality complaints or health concerns it may be appropriate to inspect and screen the building for problem mold or other moisture or water-related problems. Where you find efflorescence in a building indoors, you should look for problem mold, allergens, bacteria. Look on organic surfaces - wood, paper, painted surfaces, insulation, fabrics, carpets, carpet padding, or in settled dust and debris. Keep in mind that mold may also be hidden in building insulation that has been wet even it it looks clean. Efflorescence and water stains may explain spalling brick or concrete block foundation walls observed in a basement or crawl space. Putting aside for a moment all the whining I've already done above about mold, rot, bugs, and wet-basement anxiety, efflorescence on a masonry foundation more likely to be a cosmetic issue or a moisture diagnostic clue than a structural problem. Watch out: but the same water around a foundation or under a concrete slab that is causing efflorescence and water stains might also be a source of foundation or slab damage from frost, earth pressure, or in some locales, expansive clay soils. A careful inspection of the building foundation can help put this question out to pasture. Reader Question: has the foundation of my building been damaged by efflorescence? I am sure from your wonderful informative site and comments that the home I'm looking to put a bid on has this Mineral Efflorescence problem. My question is: the home was build in 1950, and I guess may have sand block for basement foundation. With the walls having been wet and causing the problem could the strength of the foundation be effected? I will fix the leakage if/when I get it,but if the foundation is soft couldn't the home be jeopardized in crumbling apart? Also,the is only walk-in height to the older part of the home and it appears the additions put on in 1992 can't be inspected correctly due to being crawl spaces. I would imagine there may not be that issue in there as it's newer block but again I understand that water is water if leak is extensive and may be mineral effected too. They do have a dehumidifier down there and it does not smell musty or damp. Thanks in advance for help on this. I'm not sure what "sand block" is - I use the terms "concrete block", "cinder block" - an older softer form of concrete block, and masons call these building units "masonry block". I infer that the masonry block in your building is relatively soft or perhaps crumbly. I can't accurately diagnose just what's going on from just an e-text and I'd like to see some photos of the condition of the foundation as well as photos of the home exterior to get an idea what's happening with roof or surface drainage around the home. Our email is at the page bottom CONTACT link. 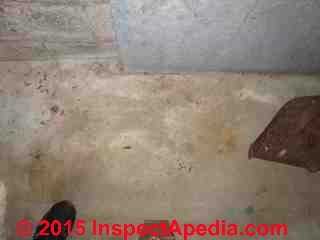 that someone knew of this condition as the foundation in one of the photos was painted with a masonry sealer. 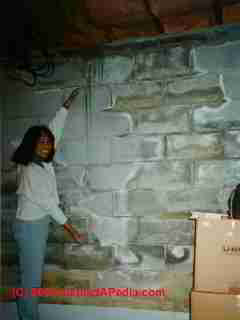 The photos of spalling concrete block foundation walls shown above were contributed by Kingston NY home inspector Arlene Puentes. See ABOUT InspectApedia.com for her contact information. Most masonry foundations have far more compression strength than needed to support the weight of a typical 1-3 floor residential structure. But if you see actual compression or other actual foundation damage such as I listed above, I'd ask for a repair estimate from an experienced mason. decide when the external visual clues + risk mean it's cost-justified to make an invasive opening to inspect where otherwise we cannot see. See SPALLING CONCRETE BLOCK WALLS & CHIMNEYS for help identifying block foundation damage and for more about spalling concrete block. to read more about how to decide when to dig deeper. Please see EFFLORESENCE REMOVAL & PREVENTION for examples of white mineral effloresence deposits on a building exterior on chimneys or foundation and a discussion of the cause and cure for that condition. How Old is the Efflorescence on a Building Surface & How Quickly Can Efflorescence Form? I would like to know the typical length of time that is necessary for a crystal-like efflorescence thing in my photos to develop. I was told that it would take "years". I believe mine developed over a period of 3-6 months. Is that possible? Thank you again. Background: I have spent nearly $4000 on a water intrusion situation that is no where near resolved. We live in the Dallas, TX metro area. 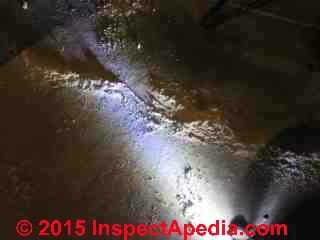 Our property experienced a 3+ month long recurring city water main break beginning in Oct 2009. During this time period I discovered mold growing all over household items and furniture. It was not until Feb. 1, 2010 that I looked in crawl space and discovered standing water on top of plastic vapor barrier. For the last three months I have consulted dozens of local experts, including engineers, foundation and drainage companies. My home owners policy rejected my claim as it was a city line that broke. The city insurance rejected my claim saying they have "governmental immunity". Prior to the flooding event I have lived in this home for 13 years with no problems. It has only been since the city water main break that we have had these issues. The final repair to city line was completed in January. My crawls space has been so wet that no one will venture under there. In April we installed an open face surface drain to catch roof and surface water to see if that would help. Even after this modification it now seems that with each subsequent rain event that more water is entering the crawl space. we are at my wits end and have about run out of funds to address this problem. I have been in contact with my city council person and my goal is to try and get the city to help remediate this mess. I have a difficult task of "proving" to them that they are responsible for this. I believe the city water leak put so much pressure against my perimeter concrete foundation that what we are looking at is a form of efflorescence, rather than a fungus suggested by a city worker. Notice the weird staining patterns behind the crystal thing. Would you be willing to comment about what you see in these photographs? - S.M. OPINION - is it Efflorescence? 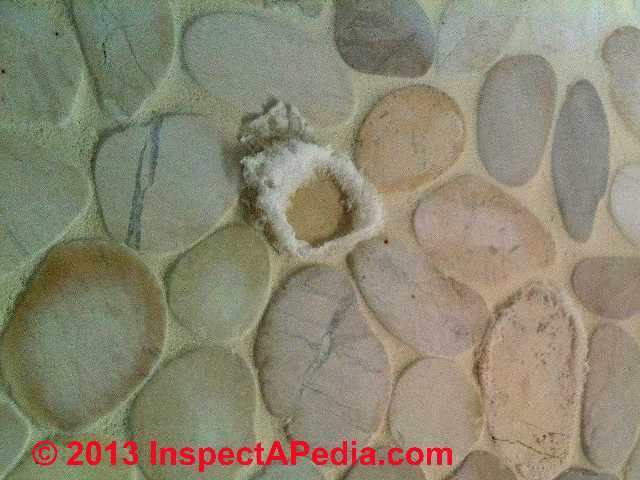 : It is pretty easy to distinguish between mold and efflorescence, as photos on this page show. 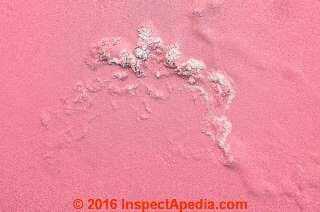 Efflorescence is a crystalline mineral salt. It looks crystalline under magnification, even low magnification. The photo at left gives an idea of the typical size & scale of mineral efflorescence formed on a building surface. Mold is an organic growth and certainly does not look like crystals. 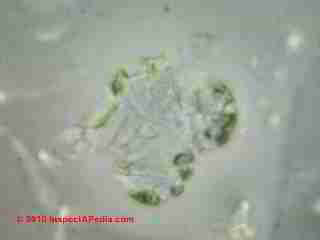 See MOLD APPEARANCE - WHAT MOLD LOOKS LIKE. Watch out: the same conditions that produced efflorescence mean that there has been high moisture or even water in the building, just as you described above. So where efflorescence is found in a building, mold contamination may be present in the same or even other building areas (moisture travels upwards through a building from a wet basement or crawl area.) 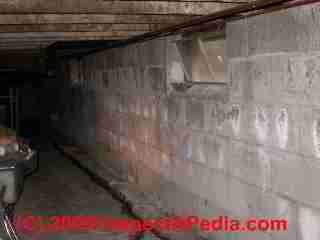 In addition to checking for mold contamination, it is very important to dry out the crawl space and keep it dry. OPINION - how old is the efflorescence? : Age of efflorescence: we don't agree that "years" are necessary before efflorescence becomes visible on a building surface. The photographs shown above (mineral efflorescence around as single loose stone tile in a floor or wall - in this photo a new shower enclosure) may have been of an old condition, but as we have found such stains on homes just a year or two old, and we have found efflorescence appearing in days after a leak or flooding event in a building. Clearly the rate of formation of mineral salt efflorescence on a surface depends on local conditions and a number of more technical variables. The lack of extensive rust or stains on other crawl surfaces argues that the water intrusion may be more recent than the age of the home. Basically to find efflorescence on a building surface we need moisture wicking through masonry, then evaporating off of the surface to form effloresence.The rate of deposition of crystals probably depends on the level of soluble salts in the masonry through which water is moving, the level of other dissolved minerals in the water, other water chemistry factors, the extent and frequency of water source. All of that technical depth is beyond our expertise. But in general, we would not be surprised to see white stains on a masonry block wall in 6-months to a year if conditions are right. Some moisture stains and efflorescence do have an older look, a sort of crust, that seems to form after a longer time of wet and dry cycling. It's an interesting question - let's hear from some masonry chemists. CONTACT us if you have more information on efflorescence age. Watch out: while we are sure that efflorescence can form on a masonry surface within months under the right conditions, don't mistake "old" efflorescence for "new". Some light efflorescence deposits can be quite old on a building wall. 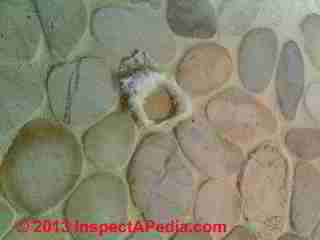 But if you are sure that efflorescence satins on a surface did not have white efflorescence stains, yellow efflorescence stains, brown stains (as in our photo at left), tan efflorescence or stains at a particular time, and the material appeared more recently by your own observation, we agree that it is certainly accurate and reasonable that the correct assessment is that the efflorescence is new. You may be able to sort out the age of efflorescence using some of the same thinking we use to sort out the age of mold: look for other evidence of the history of leaks or water entry such as other stains, or rot. 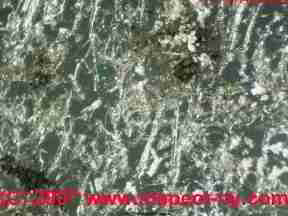 See MOLD AGE, HOW OLD is the MOLD?. Part of the article talks about how long it takes for efflorescence to grow. You estimated that it could grow in as little as 6 months and you asked people to contact you if they had information regarding growth rates. Well, I have info! I live in Aurora, CO and we just had some historic flooding. Prior to this week, my basement was fairly dry. In the past 4 days, my basement has flooded three times with fresh rainwater that seeped through concrete foundation walls and then pooled on my concrete floor. I was able to pump out and remove all visible water fully between each of the floods and I had fans going to dry the rooms out. I noticed the white stuff after the first flood and I sprayed it with Simple Green cleaner. After the next flood, it was back and slightly worse. After the 3rd flood it was back and much worse. This time I sprayed with Clorox Cleanup with Bleach. It can grow OVERNIGHT to a height over 1/2 inch. Sorry I didn't measure before spraying it with bleach! Upon contact with any form of liquid it disappears, so I'm guessing it really isn't mold as I had previously feared. Whew! But I still don't know how to remove it. It looks scary and I don't want my tenants to think we have a mold infestation. I haven't tried scrubbing it yet... just spraying. It is snow white and grows up vertically in tiny strands. It looks like incredibly fine hair. If you rub it between your fingers, then it turns into white powder. Thank you for your note - indeed efflorescence can appear quickly, and indeed I owe the topic some citation of sources on growth rates - for which your own experience and report are very helpful - I'll add that information to our published data. I did want to remind you immediately that using chlorine bleach is totally unnecessary when dealing with efflorescence. Because efflorescence on masonry is a mineral crystal formation, it is not biological in nature: so "killing it" or "bleaching it" is both unnecessary and ineffective. In fact adding any evaporating liquid to the surface may simply increase the next rate of efflorescence formation. Spraying the identical site with water, or soapy water, or any household cleaner would be equally effective in removing the material, but I do NOT recommend this approach because we are adding moisture and thus starting a new cycle of evaporation from the surface - which in turn pulls more moisture through the wall from a presumably wet or moist exterior side. I'd prefer to HEPA vacuum or just wipe the surface. If for cosmetic reasons we need to use a liquid cleaner, use as little as possible. 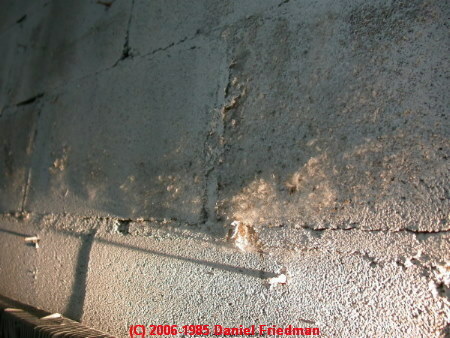 Ultimately the solution to efflorescence (which is not always economically feasible) involves removing the water source from the other side of the surface on which efflorescence is appearing or "growing"
Without that step, we can slow, but not halt, efflorescence formation by sealing the exposed or presumably interior masonry wall surface. by slowing evaporation from that surface we slow the pull of moisture through the wall, thus slowing the rate of efflorescence re-growth. For efflorescence that appeared only in response to an indoor flood event such as a burst pipe, drying and cleaning the interior is the key step. Nonetheless efflorescence may reappear on the previously affected wall for a time, even in this case, if the wall structure itself has absorbed much moisture. Because some clients have on occasion sent samples to our lab that really should not have been collected, much less looked-at, we provide this library of photographs of things that are "not mold" and don't need to be tested. These are substances that you can easily learn to recognize in buildings. Save your mold test money, and increase the accuracy of your mold contamination inspection or test for toxic or allergenic mold in buildings: review these items to learn recognize non-fungal materials or even possibly harmless cosmetic "black mold" often mistaken for "toxic fungal growth." So many people have written, sent photos, called, and even sent samples of efflorescence or other things that are not mold that we offering these pictures and information about white and brown deposits in buildings. WARNING: Finding "not mold" material in a building does not mean that there is no mold or allergen problem. Even relatively harmless house dust collected on a surface and sent to our lab as a mold screening test can contain a surprising amount of problematic mold spores if the building has a mold problem. What about white "growth" or stuff on walls, particularly masonry walls or plaster walls? 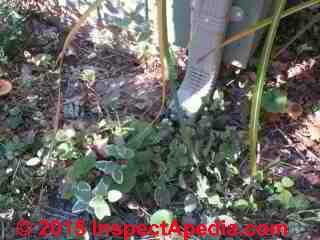 You may be looking at efflorescence - which is not mold. Reader Question: Bubbling wall surface, brown & white deposits, dusty: is this mold or efflorescence? I was looking at your very good website because I found, when I was cleaning, some brown stains and painting bubbles/peel in the closet wall. The bathroom is on the opposite side of that wall and you see on the photo that there are some piping there which I think are connected to the shower. When I scraped some of these bubbles I got some white powder like dust, however the concrete seemed to be dry with touch. There are some bubbles and peeling in the bathroom (same wall) but concrete there seemed to be also dry with touch. Do you think I have mold on my hand or just some stains which I can fix by scraping of the peeling painting and repaint? Ps. The air humidity is normally 30-40% often nearer 30% mark. A competent onsite inspection by an expert usually finds additional clues that help accurately diagnose a problem such as the moisture source that has caused the wall damage in your photograph. And certainly we can't absolutely identify building materials by email and photos, but that said, your photo looks to me like mineral efflorescence and bubbling paint on a masonry wall. So if the wall in your photo is solid masonry such as painted solid concrete, concrete block or stucco or cement over a masonry wall, we're most likely looking at mineral salts left behind as moisture evaporates from the wall surface. The lifting power of the mineral crystals of efflorescence that form during moisture evaporation is quite strong, easily pushing paint off of the painted concrete wall to form the bubbly surface in your photo. Take a closer look at that whitish or light yellow "powdery" material on the wall, using a magnifying glass and I expect you'll see that the material is crystalline - mineral efflorescence - not organic mold structures. See the text in our EFFLORESENCE article just above for more illustrations of mineral efflorescence Typically the problem comes from moisture leaking through masonry walls. I would not assume there is no mold in other areas of the the building however, particularly if you've had other leaks that wet more mold-friendly materials that support fungal growth such as wood, drywall, paper, carpeting. Can Mold Even Grow on Masonry? On some buildings, usually outdoors, there are even some mold genera/species that will form directly on the masonry surface, though more often we find that stains are actually algae, not mold. Finally, regarding your observation that "The air humidity is normally 30-40% often nearer 30% mark." - that's a pretty low indoor humidity level. But I'll bet that the location where you are measuring the relative humidity is not the surface of that bubbly stained wall, right? Typically when I see a masonry wall that looks like the one in your photo I find a leak or water source outside the wall, one that is sending moisture through the wall. The lower indoor humidity actually speeds the formation of efflorescent salts because the relatively dry indoor air helps speed moisture evaporation from the wall surface - leaving those salt crystals behind on the wall. My advice: see if you can find and fix the moisture source that is causing the wall damage from efflorescence in your photo. 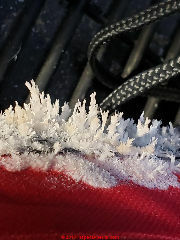 Question: white crystalline growth on roadside emergency bag containing flares. Found these white crystals growing on a road side emergency bag I have under my back seat. It did not feel wet, I opened it up and the flares and everything else seemed just fine, also no crystals inside. I was thinking salt or mold but it's just localized to that one spot. I agree that the material looks like crystals, not a fungus. If you look inside the bag and see no deposits whatsoever in the corresponding area of the fabric then own would think that some salt or chemical (perhaps from a leaky flare) got onto the fabric. 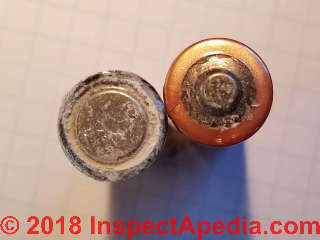 I've seen similar white crystalline growth at battery terminals, at leaky batteries (shown below), at old (and unsafe) road flares, and from other chemicals. The surrounding surfaces may indeed appear to be and are actually rather dry. Most roadside flares are comprised of strontium nitrate, potassium nitrate, or potassium perchlorate, mixed with a fuel substance as simple as powdered charcoal or possibly sawdust, along with aluminum, magnesium, or a polymeric resin. The aluminum or magnesiunm provide extra energy to produce a very bright and faster-burning combustion when the flare is ignited. 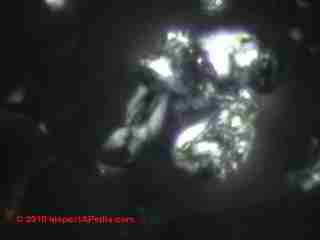 Emergency flares are packaged in a moisture-resistant container and resist deterioration and chemical leakage, but the combination of age and vibration as they spend their life waiting in a roadside emergency bag along with exposure to high storate temperatures when left in a close vehicle can still take its toll on the flare's life and lead to leaks that might explain the crystals in your photo. Watch out: such crystals from a battery leak or roadside emergency flare leak may be chemically active and harmful, particularly if you get the material in your eyes. 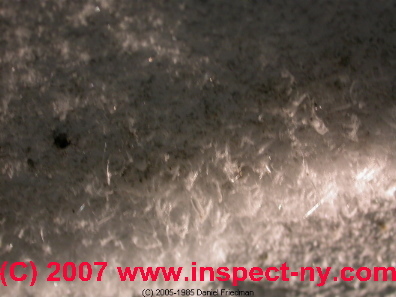 Similar white or gray crystals are found on terminals of vehicle batteries and at the cases of leaky flashlight batteries. Those crystals are typically a goopy mess of water and ammonium chloride or zinch chloride. Duncan, P. Brent, Robert D. Morrison, and Emily Vavricka. "Forensic identification of anthropogenic and naturally occurring sources of perchlorate." Environmental Forensics 6, no. 2 (2005): 205-215. Federman, Jane H., and Joseph J. Sachter. "Status asthmaticus in a paramedic following exposure to a roadside flare: A case report." Journal of emergency medicine 15, no. 1 (1997): 87-89. Finkelstein, Don B. "Pyrotechnic flare." U.S. Patent 3,051,085, issued August 28, 1962. Herman, Zelek S. "Ionic crystals: A simple and safe lecture demonstration of the preparation of NaI from its elements." Journal of Chemical Education 77, no. 5 (2000): 619. Flares are a safe and stable item to store. The U.S. Departments of Transportation classifies flares as a flammable solid, but they are not particularly sensitive to initiation. There is no threat of mass explosion, nor is there any threat of an individual flare exploding. Flares should be stored in sealed bag, away from flame and heat. Failure to store in sealed bag will diminish flare performance. While flares have no expiration date when properly stored, storage above 120 degrees F for a long period of time (more than 1 week) should be avoided. 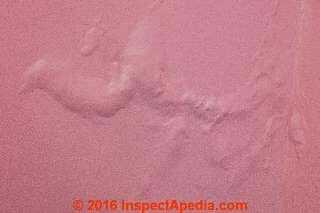 What Causes Powdery White Blotches or Mottling in Paint on a Stucco Exterior Wall? Stucco Bloom. Our photo shows white blooming efflorescence and mottling appearing on painted stucco after less than a year of application of paint onto a new stucco exterior wall in the Southwestern U.S.
See PAINT on STUCCO, FAILURES for details of paint failure diagnosis on stucco surfaces. Painting over cracks where moisture has not fully evaporated or painting over a new stucco wall too soon and where the wall pH or alkalinity remains too high (over 11) can lead to both cosmetic problems as well as early wear or failure of the painted coating. The application and curing procedure used for stucco, in turn affect the wall pH - it needs to be tested by the painter before the paint job begins. at EFFLORESENCE REMOVAL & PREVENTION - What steps should I do to remove efflorescence from my building?. Continue reading at EFFLORESENCE REMOVAL & PREVENTION or select a topic from closely-related articles below, or see our complete INDEX to RELATED ARTICLES below. Or see EFFLORESENCE SALTS WHITE DEPOSITS FAQs - questions and answers about white effloresence that were posted originally on this page. Or see WHITE MOLD PHOTOS - is it mold or effloresence: in this case it's a fungus or a white or light coloured mold growing in buildings. 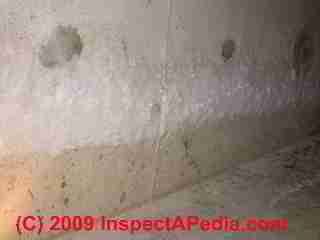 EFFLORESCENCE SALTS & WHITE DEPOSITS at InspectApedia.com - online encyclopedia of building & environmental inspection, testing, diagnosis, repair, & problem prevention advice. Questions & answers or comments about white & brown building stains & deposits: efflorescence causes, significance, cures. Try the search box just below, or if you prefer, post a question or comment in the Comments box below and we will respond promptly. illustrates construction details and building components, a reference for owners & inspectors. Special Offer: For a 5% discount on any number of copies of the Illustrated Home purchased as a single order Enter INSPECTAILL in the order payment page "Promo/Redemption" space. Special Offer: Carson Dunlop Associates offers InspectAPedia readers in the U.S.A. a 5% discount on any number of copies of the Technical Reference Guide purchased as a single order. Just enter INSPECTATRG in the order payment page "Promo/Redemption" space. The Home Reference Book - the Encyclopedia of Homes, Carson Dunlop & Associates, Toronto, Ontario, 25th Ed., 2012, is a bound volume of more than 450 illustrated pages that assist home inspectors and home owners in the inspection and detection of problems on buildings. The text is intended as a reference guide to help building owners operate and maintain their home effectively. Field inspection worksheets are included at the back of the volume. Special Offer: For a 10% discount on any number of copies of the Home Reference Book purchased as a single order. Enter INSPECTAHRB in the order payment page "Promo/Redemption" space. 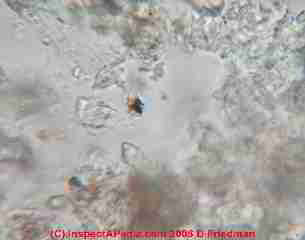 InspectAPedia.com editor Daniel Friedman is a contributing author. Or choose the The Home Reference eBook for PCs, Macs, Kindle, iPad, iPhone, or Android Smart Phones. Special Offer: For a 5% discount on any number of copies of the Home Reference eBook purchased as a single order. Enter INSPECTAEHRB in the order payment page "Promo/Redemption" space. Home Inspection Education Courses including home study & live classes at eleven colleges & universities. Home Inspection Education Home Study Courses - ASHI@Home Training 10-course program. Special Offer: Carson Dunlop Associates offers InspectAPedia readers in the U.S.A. a 5% discount on these courses: Enter INSPECTAHITP in the order payment page "Promo/Redemption" space. InspectAPedia.com editor Daniel Friedman is a contributing author.